As I talked about earlier this week, I believe everyone should have at least one geek claim to fame, no matter how minor or common that claim to fame may be. If you're proud of having seen one single episode of Battlestar Galactica while the rest of your family members have never heard of the show, then bully for you; you've got a geek claim to fame. Alex and I have achieved a level of geekiness where we have many geek claims to fame, and they tend to be reasonably uncommon and fairly impressive; if you're a non-geek and view our accomplishments as something of a waste, or if you're an übergeek who can one-up us on any of our claims to fame, then we're doing things right. Major or minor, impressive or not, collected here are some of our favorite geek claims to fame, all of which are true. We do new geeky things all the time, so you can expect this list to grow in the future. We encourage you to share your own geek claims to fame! Nathaniel rode the big ferris wheel used in the James Bond film The Living Daylights. He also visited the concert hall and the fancy garden seen in The Sound of Music. 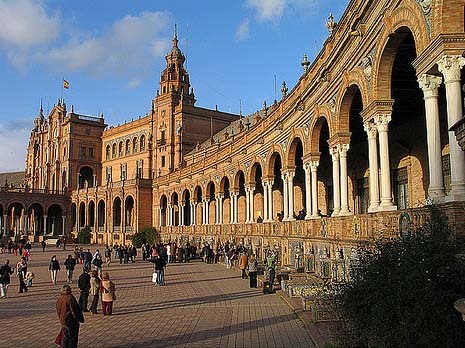 Furthermore, he's been to Naboo--at least, to the Plaza de España in Seville, Spain, which appeared in Star Wars: Episode II: Attack of the Clones as a place on Naboo. Alex owns five original comic art pages from The Goon. Nathaniel visited the bridge of the Enterprise-D, sat in the chairs of both Captain Picard and Captain Kirk (replicas, at least), and has seen the actual Enterprise model used for filming on the original Star Trek. Alex once hung out in a comics shop from open to close. Nathaniel has on his computer the music to nearly every video game he's ever played for more than about 5 minutes. Almost 8000 tracks and counting! Alex has more books on his "to read" pile than he does on his bookshelf. Nathaniel beat Mega Man X (SNES) in exactly one hour, he has done several one-day Mega Man marathons in which he played through every classic Mega Man game he owned at the time, and he has more Mega Man-centric claims to fame than there's really room to mention here. But you can see those for yourself in his YouTube videos. Alex has heard of Mega Man. Nathaniel has dressed up for Halloween as Luigi, Mega Man, Geordi La Forge, Sonic the Hedgehog, a white wizard from Final Fantasy (before 8-Bit Theater infected the public consciousness with the notion that the white mage is a girl), a California Raisin, and a LEGO person. He attended Otakon dressed as Crono from Chrono Trigger one year, and another as Gaspar, the Guru of Time. He also participated in the midnight launch of the last few Harry Potter books at his local library by posing as Gilderoy Lockhart. Alex saw each of the original Star Wars movies...ONE time EACH!...and 30 years late. Nathaniel watched all six Star Wars movies back-to-back in a single day with his friends, and he has also watched nonstop marathons of the Pirates of the Caribbean trilogy, The Matrix trilogy (with snippets of The Animatrix thrown in for good measure), Neon Genesis Evangelion (the entire series plus both movies, broken into two sessions), and the extended editions of all three Lord of the Rings movies. Alex once saw Neil Gaiman eating french fries at a convention. Nathaniel has memorized and can recite the "Weird Al" Yankovic semi-gross song "Albuquerque," and for a short while, he could also recite Arlo Guthrie's "Alice's Restaurant." Nathaniel used to sing in the choir with Spencer Clark. (Look him up.) He went to church with novelist Joan Bauer. He also possesses a dollar bill that was signed in person by Ben Stein--basically, he won Ben Stein's money. In addition, he has autographed pictures of David Graf (Sgt. Eugene Tackleberry from the Police Academy movies), David Newell ("Speedy Delivery" man Mr. McFeely from Mister Rogers' Neighborhood), and James Doohan (Scotty from Star Trek). Plus, he's got official photographs of real astronauts and space shuttles and satellites... taken in outer space. Furthermore, Nathaniel has met and received autographed somethings from Wil Wheaton (Wesley Crusher from Star Trek: The Next Generation) and Bill Amend (FoxTrot cartoonist), and got them both to hold up a sign celebrating this very blog. Alex is friends with Nathaniel. I had two books signed by Neil Gaiman. I have a picture taken with Neil Gaiman. Neil Gaiman has replied to five of my tweets. I graduated from high school at 16. I can make macaroni and cheese from scratch. I own all of the Tom Swift (second series) books. I own all of the Don Sturdy books. I've built a computer from parts. I've rotoscoped lightsaber blades into a movie. I've scanlated and released ten chapters of a manga by myself (and it was popular). I own a Canon 450D. I own a cell phone with a 8.1 megapixel camera. This guy has a pretty amazing claim to fame himself.